Cover: Painting of Dade Massacre in 1835. On December 28, 1835, Major Francis Dade began leading 110 soldiers from Fort Brooke (present day Tampa), on a resupply mission to Fort King (present day Ocala). 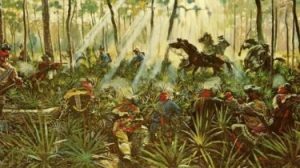 Prior to reaching Fort King, Dade and his men were attacked by 180 Seminole Indians. Only three soldiers survived the attack. Private Edward Decourcey was later pursued by a lone Seminole Indian on horseback and killed. Private Ransom Clarke had split from Decourcey, and made it back to Fort Brooke. He provided the only account of the attack by a US Solider. The third soldier was Louis Pacheco. The attack began the Second Seminole War. Francis Langhorne Dade was a Major in the Fourth Infantry Regiment for the United States Army. He was born in Virginia and joined the Army in March of 1813. He was brevetted major in 1828. 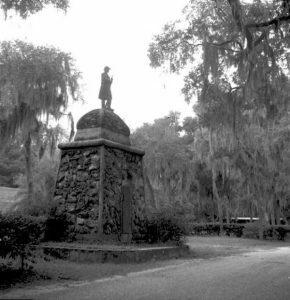 Figure 1: Monuments at Saint Augustine Cemetery. The soldiers who lost their life during this battle are memorialized by the Dade Monument in Saint Augustine National Cemetery. 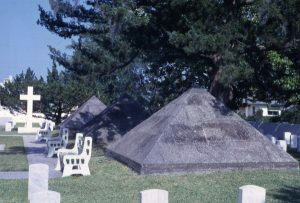 The monument consists of three pyramids constructed of native coquina stones. The dedication of the monument took place on August 14, 1842. The battlefield was also memorialized. It is now Dade Battlefield Historic State Park. There is a monument of Major Dade in the park. Finally, the county that Miami resides was named for the fallen Major. On February 4, 1836, the Florida Legislature voted to name a new county in honor of Major Francis Dade. The county name was changed by voters on November 13, 1997. The official name of the county became Miami-Dade County. Read more information in the book “History of the Second Seminole War 1835-1842”, by John K. Mahon. Figure 2: Monument at Dade Battlefield Historic State Park.